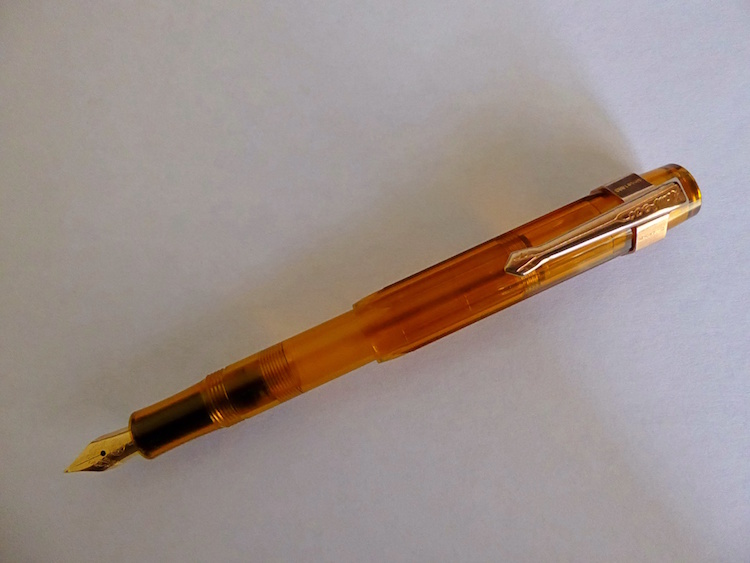 (01-17-2016, 12:24 PM)freddy Wrote: I have a Kaweco Sport clear demonstrator fountain pen with an extra fine (EF) nib that has been my everyday carry for a few years. I love its incredibly smooth writing and the fact that it is a pocket pen so, when capped, easily fits into some of my shorter polo shirt pockets. However, over the years, it has taken some knocks. The cap has a small crack in it from an accidental drop and, because of that, will sometimes separate from the pen body while in my pocket (though I have never had an inky mess because of that). For the last few months I have been thinking of replacing the pen with a new one. 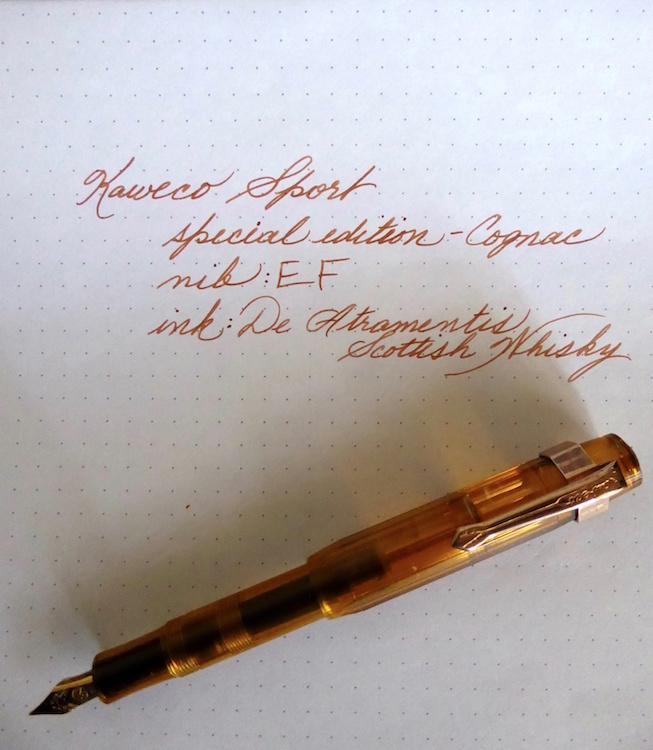 A couple of weeks ago, I came across a German company on the web and saw on their site a Kaweco Sport special edition Cognac demonstrator. I have not seen that color here in the U.S. and it was love at first sight. Not only that but they offered a bronze colored clip instead of the usual gold color. The clips are sold separately and are removable. 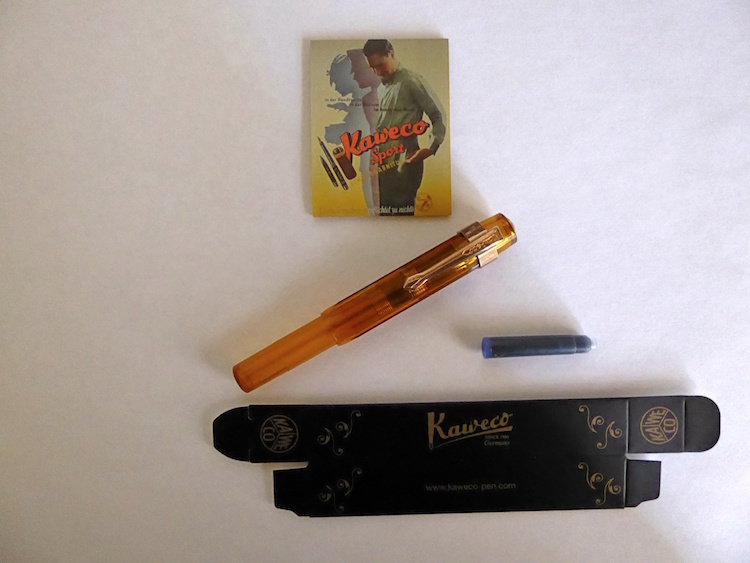 The price for the pen was considerably less than what a popular American web company was charging for their Koweco Sports ($20.53 vs. $27.00 for the EF nib versions) and the American company didn't have the Cognac color. Even when adding the cost for the clip, it was less than for the pen alone at the U.S. based company. Add to that the fact that shipping from Germany was free ( ) and the pen was being sold for a bargain price, in my opinion. I decided to take a chance so ordered the pen and clip. The company states to expect a wait of 1-2 weeks for the mail to get through, even though they ship same or next day. I ordered it on 4 January and it arrived somewhere between the 10th and 13th. I was out of town then so do not know the exact date it was delivered but that is darn good from Germany to San Diego. If anyone is interested, here is the site: seitz-kreuznach.de. They sell many interesting articles and seem to accomodate folks from the United States, Canada, the United Kingdom, Australia, and Japan, as well as Germany (and I assume the EU) specifically. The pen was put in a thick cardboard envelope but the company even included the box, collapsed, and the little flyer about the pen. 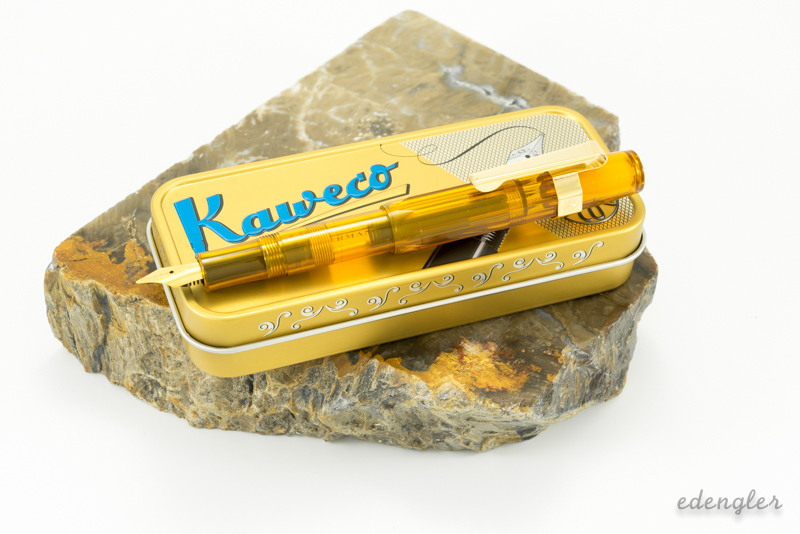 All Kaweco Sports come with a cartridge. A writing sample. Rather than use the blue cartridge that came with the pen, I filled an empty cartridge with De Atramentis Scottish Whiskey ink. This is a scented ink but only if you get close while writing. It dries scentless, though I do like the color and think it is a great match for the color of the pen. Cognac and Scotch, what an alcoholic writing experience. (01-17-2016, 02:06 PM)eengler Wrote: Thanks Freddy, Goulet does not have it listed but I found bottle elsewhere. I noticed that after I posted this, Ed. Either it's no longer made or Goulet dropped the color. 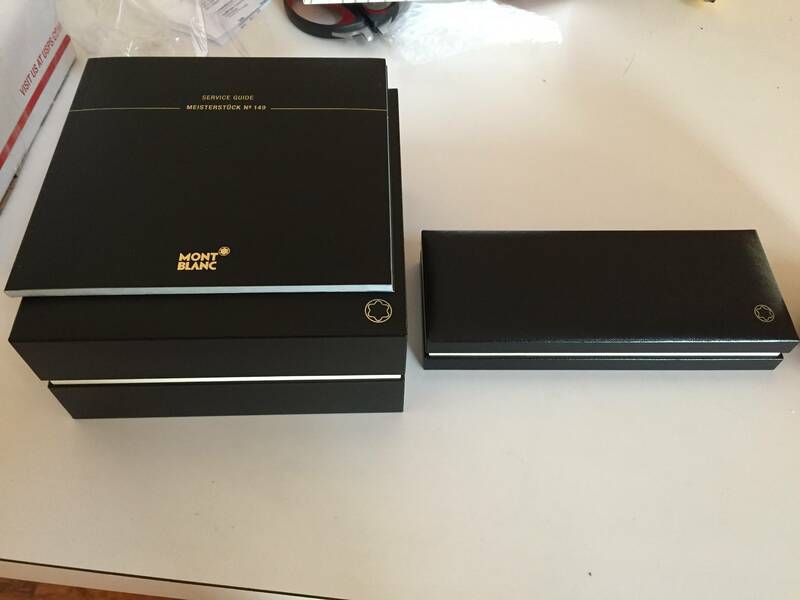 Ed, I saw that gift set after I ordered my pen otherwise I would have purchased it, instead. 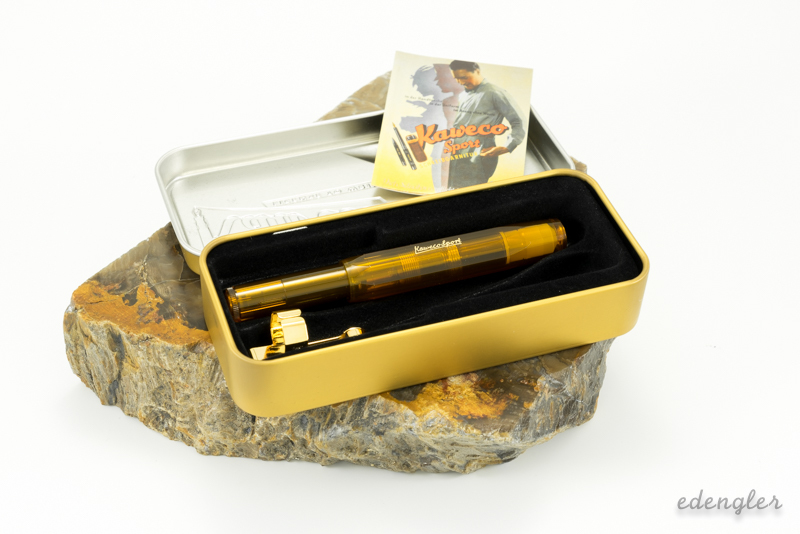 I am very happy with the Cognac pen and think you may be, as well. Go for it Java, one can never have enough fountain pens. I like the way you think, Aleksey. You have many great pens Phillip! Grab a plexi thater! 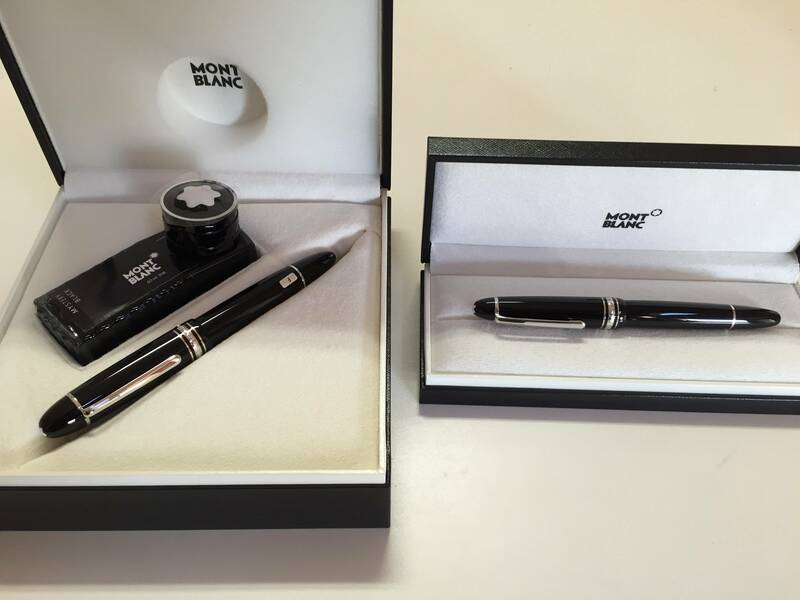 (01-20-2016, 02:13 PM)Aleksey Wrote: You have many great pens Phillip! Grab a plexi thater! It is my understanding that the 4125 and 49125 brushes have the same backbone/density. The main difference being the plexi handle vs the black/ivory ones. 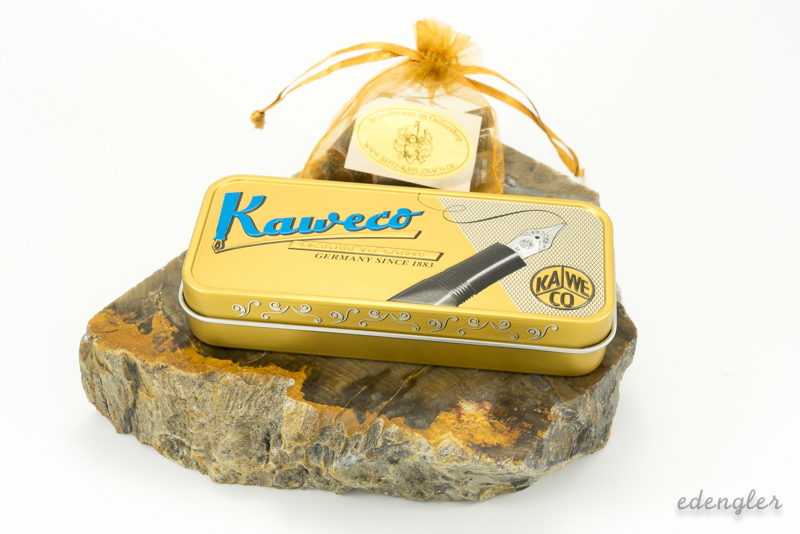 With inspiration from Freddy I received my Kaweco Sport Gift Set today. 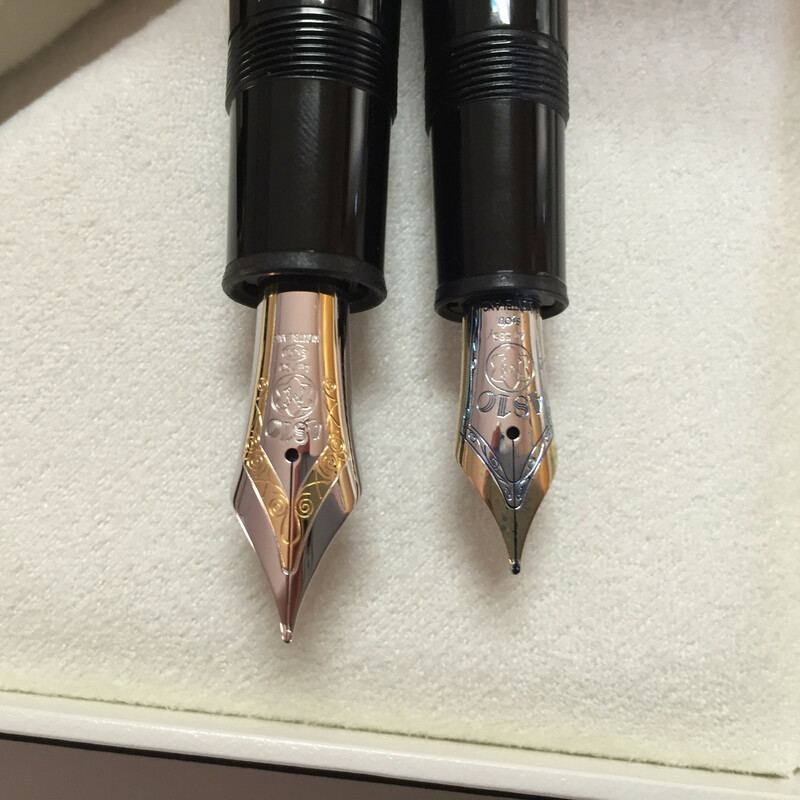 EF Nib, Gold Clip, and cartridges. Will give it a run at work tomorrow. Lovely, Ed! Enjoy the pen. Very nice Ed! What is your ink choice for this beauty? Thank You Celestino and Oguz! The set was supplied with Seitz Kreuznach Colors of Nature LE Chestnut Brown so I will start with one to see. I sent a Christmas letter to some friends and mentioned I had gotten into fountain pens in 2015. The husband received two pens through his job at Dell, he didn't want them, and *gasp* he was going to throw them away! Fortunately, his wife suggested I might want them, and she dropped them off last night. 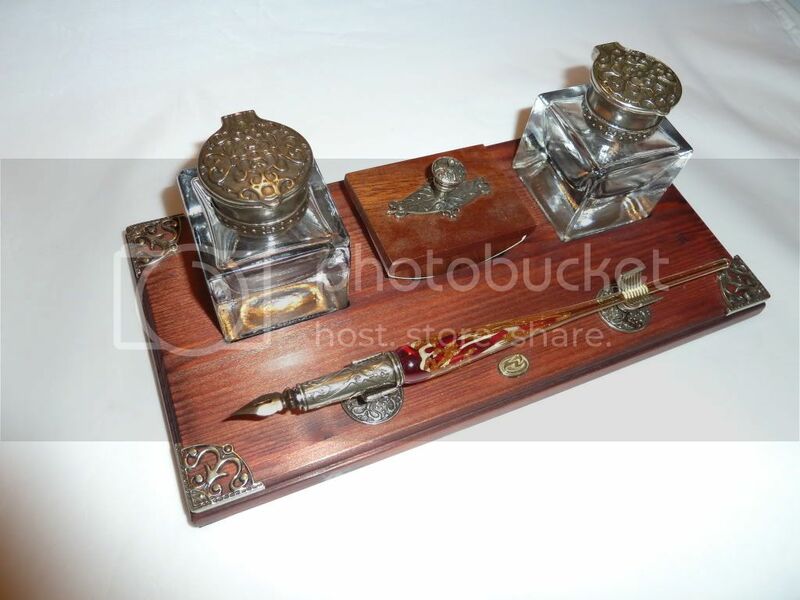 The first is a Francesco Rubinato dip pen from Italy, which included the holder and a bottle of blue ink with a wax seal. I found an online retailer selling them for $101. This is my first dip pen, and I quickly penned them a thank you letter last night with it. It feels like a medium to broad nib based on the line width. The second is a C/C Aldo Domani with a German iridium nib. It appears to be an inexpensive pen; however, it feels good in hand, and writes a nice medium line. 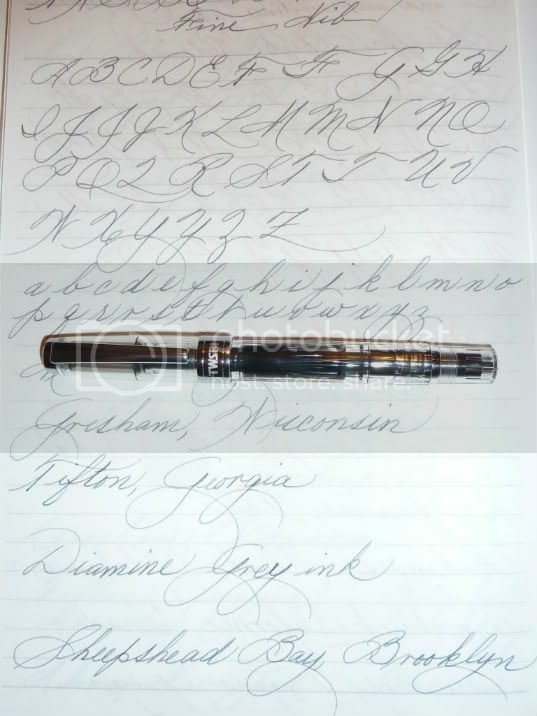 As for a pen around the $50.00 mark, I really like my TWSBI Diamond 540. I have a fine nib on mine. (01-13-2016, 01:16 PM)number six Wrote: Quick question: can I sell a Vanishing Point pen on TSB BST? *** edit: I looked again and now see pens in the BST rules. sorry for the interruption. Inactually got hooked on fountain pens by buying your Vanishing Point.' Really love the pen's smooth nib! You have unlesshed a monster. I worked 2 fourty hour work week jobs from july though the end of October. Picked out a pen they could act as a representation of " well done"